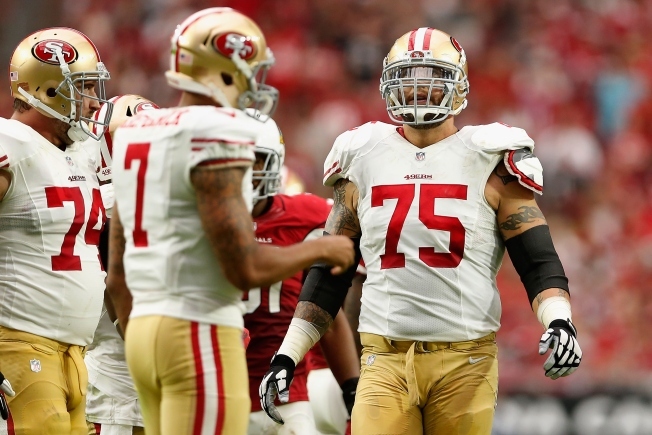 Not long ago, it appeared Alex Boone was on a path to stardom. After being converted from tackle to guard, Boone became a starter at right guard for the 49ers in 2012, and the 6-foot-8, 330-pounder made an immediate impact. He was a dominating, physical blocker and teamed with tackle Anthony Davis to create a terrific tandem on the right side of the offensive line for a team that reached the Super Bowl. In his first start for the 49ers that season, Boone played very well against the Green Bay Packers, and then-offensive coordinator Greg Roman knew he had the man he was looking for at the position. Have the 49ers Fallen Into the NFL's Basement? But now Boone has left the 49ers at age 28, weakening what already was a shaky offensive line. He’s reportedly agreed to terms with the Minnesota Vikings after four seasons as a starter with the Niners. Only left tackle Joe Staley remains from the offensive line in the Super Bowl that featured Staley, left guard Mike Iupati, center Jonathan Goodwin, Boone at right guard and Davis at right tackle (though Davis may return after a year in retirement). The past two years for Boone weren’t quite as harmonious as previous seasons, as he went through a holdout, suffered an injury and was moved from right guard to left guard, where he didn’t play quite as well in 2015. Now, 49ers general manager Trent Baalke has several holes to fill on an offensive line that once was the team’s strength. There are still several solid offensive linemen remaining in free agency, but so far the 49ers have taken a very cautious approach in the market.